According to the Patriotic Service Dog Foundation, there are an estimated 460,000 Veterans from the Iraq and Afghanistan war who are struggling with Post-Traumatic Stress or Traumatic Brain Injury (TBI). One of the most difficult statistics to read is that there are approximately 22 Veterans a day who are struggling and commit suicide. The Light Up to Live and Patriotic Service Dog Foundation are working to find ways to help provide support, hope and help to our military men and women, especially those who are returning home from active duty and entering civilian life again. Randall and Sherry Reed, a military family, founded the Light Up To Live Foundation after seeing the effects of war on Veterans in a documentary. The foundation is a 501 (c) (3) public charity based in Addison, TX and founded by Randall and Sherry Reed. As a military family, they are dedicated to raising awareness about the members of our U.S. Armed Forces and Veterans living with the effects of Post-Traumatic Stress, Traumatic Brain Injury (TBI), tissue injury, pain and depression. The foundation funds polychromatic light therapy systems that have been shown to increase blood flow in the body and reduce associated minor pain for active military and Veterans that we identify could most benefit from its use. Light Up To Live helps connect these military members and their families to other organizations that are in alignment with our mission to provide direct aid and assistance. We want to light a path to better health. With these foundations having the same goal, they joined forces to maximize efforts. “I believe a service dog is a very important part in stopping this Veteran suicide epidemic and the reason for that is because of the connect with the Veteran and the dog.” ~ Veteran Josh Collins. Light Up To Live hosted a weekend of events to support our Veterans. 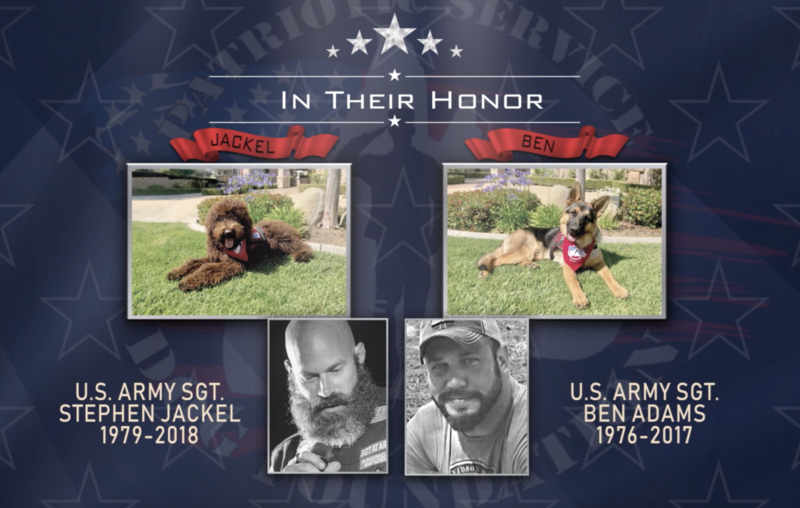 Part of the funds raised went to complete the training of two service dogs, Gentle Ben, a German shepherd and Jackel, a labradoodle who were named after two fallen heroes. These amazing dogs will be gifted to two Veterans. Jackel joined the military in 2008. During his time in the service, Jackel was deployed to both Iraq and Afghanistan where he received countless awards, including a Purple Heart. In addition, Jackel’s unit was presented with a Valorous Unit Award. While on convoy in Afghanistan on August 23, 2011, Jackel was injured when an improvised explosive device (IED) exploded underneath his RG31 vehicle. The force of the blast knocked Jackel out. When Jackel came to, he realized he was trapped inside the burning vehicle, along with his team members. While attempting to escape and save the lives of several soldiers, Jackel used his amputated leg to put out the flames around him before finding an exit through the hatch at the top of the vehicle. With the hatch open, he quickly assisted others out of the burning vehicle. The blast left Jackel with severe injuries, including bilateral below the knee amputations and a traumatic brain injury. He also received multiple soft tissue injuries from shrapnel. Although Stephen had two prosthetic legs, he never let it stop him. He truly had the Spirit of a Hero. Stephen Jackel was larger than life and known as “The Motivator”. He had a heart of gold, a contagious smile and laugh, and gave the best hugs known to man. We lost Jackel on January 3, 2018, but his memory will live on in us forever. Ben was an American soldier in the United States Army. He was a hero that willingly sacrificed his body to protect the freedom we enjoy. As a sergeant, Ben was part of the Iraqi Freedom Team. He ran over 200 missions, during his deployment. Near the end of his tour, Ben’s vehicle encountered an IED. He sustained serious neck and back injuries, as well as substantial injuries to his brain. When he returned home, we were grateful. He was still our Ben, but was never quite the same. Ben, while struggling with his own post-war issues, reached out to others who were in the same situation. It was important to him to help and support his brothers & sisters; to listen and to talk. In helping others to heal, he–in turn, helped himself. Ben was a member of organizations designed to be support networks for military veterans that often struggled with Post-Traumatic Stress, addiction, and integration into the civilian lifestyle. He belonged to 22KILL, Operation “Rock The Troops” and the American Infidels.